Many shrubs, bushes and trees must be pruned every year. This promotes circulation and allows sunlight to reach more of the plant. Trimming unruly bushes and shrubs is also pruning. Pruning needs to be done during the plant’s dormant season, which makes early spring the best time to have this done. Is your bed edging falling apart? Stone edging is a great choice for the edge of almost all landscaping beds! It is sturdy so it will last years longer than other bed edging. Installed properly, stone edgers are easy to mow next to. Best of all, natural stone edging looks great! There is no wrong time of the year to improve your lawn landscaping. Kohler Lawn provides landscaping services year round. Edging, pruning, and even large landscaping renovations are all part of your lawn’s future with Kohler Lawn and Outdoor. Start Planning Your Spring Lawn Care Now! 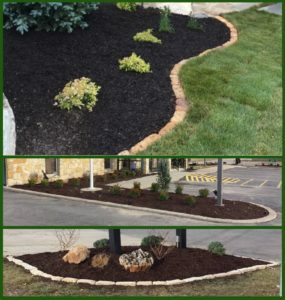 Spring is the optimal time for applying fresh mulch. WHY?